An incident from the Ramayana highlights a certain dangerous situation that is oftenoverlooked by a spiritual practitioner. On the spiritual path, adversity is a wellknown challenge, but paradoxically prosperity can be an even greater challenge. While misery can threaten our faith, pleasure can deaden our sense of purpose. The Ramayana illustrates this through the story of Sugriva, the hero who had been unfairly exiled by his brother, the simian emperor Vali, due to a misunderstanding. During the exile, after all his attempts at reconciliation with his brother had failed, he formed an alliance with Rama, who himself had been exiled from his kingdom Ayodhya and was searching for his abducted wife Sita. Rama helped Sugriva right the wrong and gain the kingdom. In return, Sugriva promised to help Rama find the whereabouts of Sita and help him regain her. By the time Sugriva was enthroned as the king, the rainy season started. The four months of rains made traveling impossible. So Rama and Sugriva agreed to wait for the rainy season to end before they began the search for Sita. During that period, Sugriva invited Rama to stay in his kingdom in a royal palace, but Rama wanting to be true to the terms of his fourteen-year exile stayed in a cave outside the kingdom. During the four-month period, Sugriva lost himself in sensual revelry so much so that he forgot his promise to Rama to organize a search for Sita. Sugriva had no intention of letting Rama down. But when he found himself in circumstances where he had an abundance of creature comforts – comforts that he had long been deprived of during his exile – he unwittingly fell for them. Time passed and the rainy season ended. Rama found no sign either of Sugriva making any arrangements for the search or even coming to discuss the plan for the search. Rama felt annoyed and angered. When he asked his younger brother Laksmana to go to the monkey kingdom to find out, Laksmana promptly did so, feeling furious at what he thought was Sugriva’s ingratitude. By the time he reached the monkey kingdom of Kiskindha, Laksmana was seething with fury. Seeing his furious disposition, the monkey-guards felt alarmed and they scurried off to the palace to warn their king of the impending danger. Sugriva’s fortune was that he had alert counselors around him. Vali’s widow Tara who was living in his shelter warned him, as did his able minister Hanuman. As soon as Sugriva realized the gravity of the situation, he snapped out of his sensual stupor and ordered that monkeys be summoned from far and wide so that they could join the search. 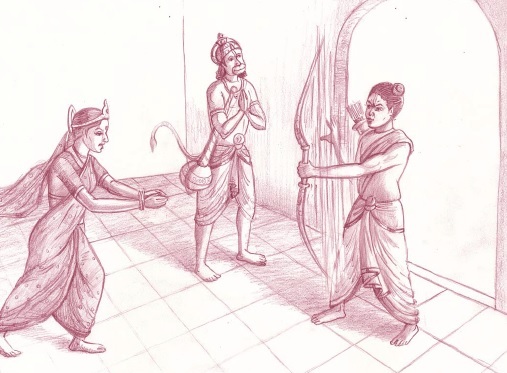 When Laksmana came to know about the measures taken, his anger calmed and in due course the close alliance between Rama and Sugriva was restored. When temptation comes overtly instead of covertly, it is much easier to resist it. Just before Rama’s army launched its offensive on Ravana’s citadel, Ravana with his typical evil scheming tried to engineer a split in Rama’s forces. He sent messengers secretly to Sugriva with gifts, stating that the vanaras and the raksasas had no hostility with each other. He further offered Sugriva a favorable agreement between the two forces if he withdrew his forces from the fray. Sugriva flatly and furiously rejected the allurement and sent a message to Ravana that by abducting Rama’s wife, he had become an enemy of Rama and by extension of Sugriva, for they were close friends. In the Srimad-Bhagavatam (1.8.25), Queen Kunti prays for adversity – the opposite of comfort – as that will help her take deeper shelter of Krishna. Of course, that prayer might sound a bit extreme, but it well illustrates the spirit of serious purposefulness, as is illustrated in another pastime in the Mahabharata. When the Pandavas are living in the forest, during one of the later phases of their exile, they ascend through the Himalayas to the heavenly arena where Kuvera, the treasurer of the gods, has his gardens. That great god invites the Pandavas to stay there for as long as they please. Though the Pandavas are technically still in forest exile, their stay in this heaven-like forested area is far more comfortable, even luxurious, than the austerity that had characterized their stay in earthly forests. But after staying there for some time, Bhima and Arjuna approach Yudhisthira and urge him to return to the earthly forest. They both feel that staying amidst comfort will make them forget the atrocities that had been perpetrated against them, deaden their martial spirit and will leave them unprepared for the war they would most likely have to fight at the end of their exile to regain the kingdom that had been wrongly dispossessed from them by the wily Kauravas. Though the Pandavas hoped for and endeavored for a peaceful solution, they were no Pollyannas – they knew the inveterate envy that drove Duryodhana meant that he would be unlikely to settle for any kind of compromise. So they needed to be prepared for the war – both in spirit and in resources. Ultimately the Pandavas had gained world sovereignty as a part of their devotional service they wanted to glorify Krishna as the topmost worshipable person in the Rajasuya-yajïa performed to sanctify their ascent to sovereignity and they wanted to ensure that the kingdom had dharmic rulers who would keep the citizens on the path to dharma. Yudhisthira agreed with the reasoning of his two heroic brothers and they soon descended to the austere forest life on earthly forests. Externally the situations and responses of Sugriva and the Pandavas were radically different. Sugriva had regained his kingdom, whereas the Pandavas had lost theirs. Further, Sugriva had forgotten his obligation to the Lord, whereas the Pandavas wanted to remember their duty. But both pastimes convey how comforts impact our sense of purposefulness – Sugriva lost that sense, although temporarily, because of immersion in comforts and pleasures, whereas the Pandavas gave up the comforts before comforts could erode their sense of pleasure. Our devotion is tested not just by adversity but also by prosperity. When we face adversities, especially when we are striving to be devotees, we may get the question, “Why is God letting this happen to me when I am trying to be devoted to him?” Such a doubt is at one level natural. But at another, more philosophical level of consciousness, we can see the misery as a confirmation of the miserable nature of material existence and as an impetus for taking greater shelter of the Lord. Indeed, for the devotionally minded, seeking deeper, more devotional shelter of God is almost a spiritual reflex action. Thus adversity, though a test for devotion, can often be an impetus for deepened devotion. In contrast, prosperity can have a subtler, more insidious effect on our devotion. We may initially be grateful to the Lord, for whatever material resources we get, remembering that we have got them by his mercy. But as time passes and we continue to live in material comfort, we may develop an entitlement complex, forgetting that the prosperity is a gift. Such an entitlement complex often characterizes modern urban living. When we live amidst cities, we are surrounded by the products of humanity, not the gifts of divinity. Of course, every product that humanity has developed – be it a plane for commuting or a phone for communicating – is based on principles and mechanisms such as the laws of motion or the semiconductor effect that is the foundation for all telecommunication. Such mechanisms are not caused by human intelligence; they stem ultimately from God’s intelligence. Indeed, for the discerning observer, every technological success is not just a testimony to human intelligence but also a tribute to divine intelligence. Advanced technology was not unknown to the bhakti literature. Both the Ramayana and the Mahabharata feature weapons whose sophistication equals, if not supersedes, that of the most hi-tech weapons developed by modern science. So in principle the bhakti tradition is not Luddite – it acknowledges and utilizes technology. The problem is not the presence of technology – the problem is the absence of God consciousness, an absence that can be accentuated by infatuation with technology and the comfort and power it brings. God has been exiled from the contemporary mind not just physically but also intellectually. By the operational principle of methodological naturalism, science, specifically modern mainstream science, has focused on seeking natural explanations for natural phenomena. But many mistake the operational principle to be an ontological principle – an unjustified extrapolation that relegates the divine from irrelevance to non-existence. The celestial weapons of the past reminded warriors of the divine realities from which those phenomenal powers originated – those weapons needed to be activated through purification and invocation, thereby reminding one that one was dependent on beings higher than oneself. In contrast, today’s technology often lulls us into a sense of godless omnipotence, wherein we can by clicking buttons achieve whatever we want. Or so we are led to believe as we are allured towards a technological paradise that is touted, overtly or covertly, as a superior substitute any spiritual paradise. In contemporary times, the more humanity is distancing itself from God in the hope of a hi-tech paradise, the more it is being overwhelmed by mental problems. Indeed, mental health problems have been declared by the WHO as the greatest health challenge of the current century. If we build a majestic temple, but put nothing sacred at the center, then that empty shrine entwines our heart in a sense of purposelessness and meaninglessness that can be profoundly disorienting, disheartening and devastating. Comforts also erode our devotion subtly. If some miscreants attacked a dam explicitly, the security forces would spring into action to counter them and protect the dam. But if a tiny leakage caused drops to seep through and erode the foundations of the dam, most observers may not even notice it – it may require a specially alert or trained eye to catch such a small leakage. But in the long run even such a small leakage can wreck the dam. Similarly, if the forces of illusion came straight out and attacked our devotion, tempting us with anti-devotional indulgences, most of us, especially those who have committed to practice some level of dharma and devotion, would reject such upfront temptations. But comfort rarely attacks upfront. It doesn’t make us reject God – it makes us just push him down our priority list as more and more comforts and luxuries raise themselves up and center of our consciousness and heart. We may acquire worldly resources for the sake of the service of the Lord and might even use them for that purpose initially, but gradually we may start indulging more and more in them till the original purpose gets forgotten and abandoned – not because of any explicit perfidy on our part but simply because of a subtle erosion of our devotional determination by the increasing sense of comfort. God surely still exists, but he doesn’t matter all that much now. He is happy there and I am happy here. 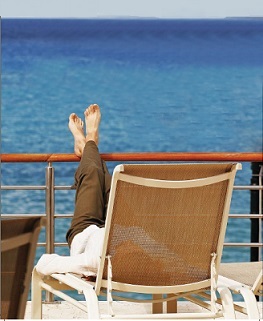 I have earned everything and am maintaining everything by my effort – why do I need him anymore? While our efforts are no doubt important, they are not allimportant, in determining what we attain or retain. Every morning birds start searching for grains and they often have to labor while doing so, but their labor doesn’t create the grains – God’s arrangement provides them, their labor only enables them to find what God has already provided. So God’s provision is primary, their endeavor is secondary, being dependent for its success on God’s provision. A similar principle applies to our endeavors too. Whatever abilities we have with us internally and whatever resources we have externally, they have all come ultimately through God’s provision – our endeavoring to use those abilities and resources is secondary to our attaining comfort and success. God’s provision is primary. To the extent we recognize this reality, to that extent we stay safe from the world’s temptations. The bhakti literature focuses not on rejection of the world but on its connection with its source. None of Sugriva’s counselors tell him to renounce the kingdom because it had induced in him forgetfulness of his obligation to the Lord. Instead, they all ask him to revive and reinforce that remembrance through practical action. Similarly, the bhakti tradition doesn’t ask us to renounce the world. While some renouncer traditions do see the world primarily as a place of entanglement and so recommend renouncing it, the bhakti tradition focuses primarily on seeing the world more positively – not so much for its capacity for material distraction as much for its potential for devotional utilization. We see the world and its resources as potentially spiritualize-able by being used in the service of the Lord. And such spiritualization is not just an act of creative imagination as of educative revisualization. That is, we don’t imagine that a world which is primarily materialistic can somehow be used in the Lord’s service. Instead, bhakti wisdom explains that everything material and spiritual comes from God and is thus intrinsically connected with him as his energy. Thus, even while in material existence, while is often thought of as a source of illusion and entanglement, we can see ourselves as being surrounded by, indeed blanketed with, God’s gifts. Sugriva didn’t have to imagine that he had some obligation to Rama – he just had to revive his memory to focus on that reality. It was by Rama’s arrangement that he had gained the kingdom of Kiskindha. So, he was literally surrounded by Rama’s gifts. So too does a devotee see comforts as God’s gifts. Rather than seeing them as agents of temptation and illusion, we can see them as expressions of his affection for us and thus feel inspired to serve him better. As God has given me such a comfortable situation in which to serve him, let me increase and intensify my service to him: increase in quantity by using all these resources to spread his glories and intensify in quality by cherishing his remembrance even more firmly in the center of the altar of my heart. Just as Tara, Hanuman and Laksmana all in their own ways reminded Sugriva of his obligation and his present deviation from the obligation and then he immediately returned back on track, similarly, we too need friends and guides who can remind us to not forget our obligation to the Lord. Spiritual association is vital for preserving our sense of devotional purposefulness. To the extent we keep ourselves in such association and to the extent we hear spiritual messages in that association – as did Sugriva – to that extent we will be safe. We won’t be caught by the material, but will see beyond the material to the supreme spiritual reality, the Lord of our heart, and keep our heart fixed on him. And that inner connection is life’s supreme comfort, the one comfort that will never become pale and stale, the one comfort that will always shelter us, and the one comfort that far from breeding complacency will kindle greater fervency in our devotion.